GRAND CANYON NATIONAL PARK— The Havasupai Tribe and a coalition of conservation groups praised today’s decision by the U.S. 9th Circuit Court of Appeals upholding the Department of the Interior’s 20-year ban on new uranium mining claims across 1 million acres of public lands adjacent to Grand Canyon. The court ruled that the ban, adopted in 2012, complies with the Constitution and federal environmental laws, and that the protected area was not too large, as plaintiff mining companies had argued. The ban protects the aquifers and streams that feed the Colorado River and the Grand Canyon from toxic uranium-mining waste pollution and water depletion. 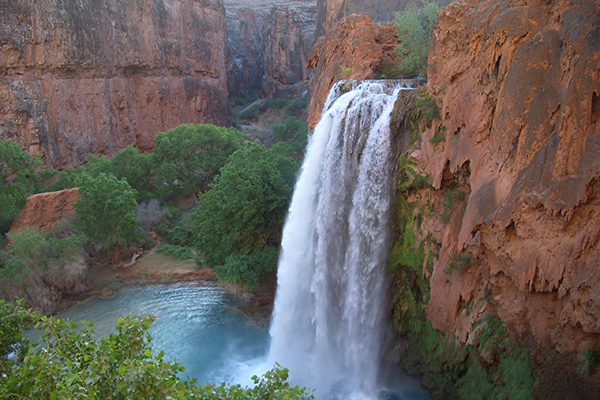 The Havasupai Tribe, Grand Canyon Trust, Sierra Club, Center for Biological Diversity and National Parks Conservation Association intervened in the case in 2013. The groups and the Department of Justice won a 2014 decision by U.S. District Court in Arizona, which upheld Interior’s 2012 uranium mining withdrawal. Mining companies appealed the decision to the 9th Circuit. “This is a great day for the Grand Canyon, for the Havasupai people who rely on its sacred waters, for the people who love this wonder of the natural world, and for the wildlife that call it home,” said Ted Zukoski of Earthjustice. In January 2012 then-Interior Secretary Ken Salazar issued the 20-year ban that prohibits new mining claims and mine development on existing claims without valid permits. The mining industry claimed that the Interior Department’s exhaustive, 700-page evaluation of environmental impacts was inadequate. Interior’s study of the mining ban showed that without a withdrawal in place, 26 new uranium mines and 700 uranium exploration projects could be developed, resulting in more than 1,300 acres of surface disturbance and the consumption of 970 acre feet of water. Under the 20-year ban, existing mine operations are projected to have about one-tenth of the surface impacts and one-third the water usage. According to Interior’s study, new uranium mining could have major impacts on springs, wells and aquifers, including increased levels of uranium beyond the Environmental Protection Agency’s drinking water standards and severely depleted groundwater, endangering public health and wildlife, and compromising the values of the tribes who consider the springs sacred. “This decision rewards years of cooperation toward protecting the water, air, and people that mining near the Grand Canyon puts at risk," said Grand Canyon Trust’s Roger Clark. “History has shown us how uranium mining can go wrong on the Colorado Plateau, and we’re glad for more time to make sure the same legacy isn’t also bestowed upon the Grand Canyon." Uranium pollution already plagues the Grand Canyon and surrounding areas. Proposals for new mining have prompted protests, litigation, and legislation to make the ban permanent. Dozens of new mines threaten to industrialize iconic and sacred natural areas, destroy wildlife habitat, and pollute and deplete aquifers. Scientists, tribal and local governments, and businesses have all voiced support for the protections enacted by Interior. One of the great symbols of the American West, the Grand Canyon was first protected as a national monument by Theodore Roosevelt in 1908. The canyon is surrounded by millions of additional acres of public lands that include wilderness areas, two national monuments, lands designated to protect endangered species and cultural resources, and old-growth ponderosa pine forests. The canyon area is also home to indigenous people, including the Havasupai, Kaibab Band of Paiutes, Hualapai and Navajo tribes, and has been designated a UNESCO World Heritage site. In 2016 the greater Grand Canyon region attracted over 6 million tourists and recreationists, and Grand Canyon tourism contributed $904 million to local economies and supported nearly 9,800 jobs. The uranium mining companies have 45 days to seek a rehearing by the three-judge panel or by the 9th Circuit sitting en banc. The companies also have 90 days from this decision, or from a denial of rehearing (whichever is later) to petition the U.S. Supreme Court for review of the 9th Circuit Court decision. Such petitions are granted in only a tiny fraction of cases. "History has shown us how uranium mining can go wrong on the Colorado Plateau, and we’re glad for more time to make sure the same legacy isn’t also bestowed upon the Grand Canyon." — Roger Clark, Grand Canyon Program Director, Grand Canyon Trust.